JohnDee is a Legacy Library. Legacy libraries are the personal libraries of famous readers, entered by LibraryThing members from the Legacy Libraries group. 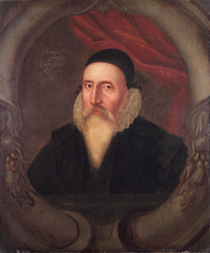 » John Dee's legacy profile. JohnDee is also an author. » See John Dee's author page. About meJohn Dee (1527-1609) was an English mathematician, natural philosopher, astrologer, and occultist, as well as a sometime advisor to Mary I and Elizabeth I. He graduated at St. John's College, Cambridge (bachelor's in 1545, master's in 1548), and studied on the Continent in 1547, 1548-1551 under Frisius, Ortelius, Mercator and others). Dee made his large library at Mortlake available for scholarly research, and was closely involved with the training of English navigators during the early days of exploration. His own works include Perfect Arte of Navigation, as well as better-known tracts on natural philosophy and the occult (the Monas Hieroglyphica). Dee also edited the first English edition of Euclid's Elements in 1570. With Edward Kelley, Dee traveled widely in Europe from 1583-89, spending time at the court of Holy Roman Emperor Rudolph II and in other regions. During this period his library suffered many serious depredations. During the reign of Mary I, Dee proposed the creation of a national library; failing this, Dee built his own. See also: John Dee Chronology. About my libraryDee's library of some 4,000 volumes was the largest collected by a single person in England to that time. Dr. Julian Roberts has written of the collection "Dee’s omnivorous reading (demonstrated by his characterestic annotation) and the availability of his library to others fed many of the intellectual streams of Elizabethan England, and he was well known to continental scholars." The library had, as an introduction to a reproduction of the collection notes, "particular strengths in the fields of Alchemy, Astrology, Astronomy, Botany, Cabbala, the Fine Arts, Geography, Hebrew texts, History, Language and Literature (especially Continental Literature), Logic, Magic, Mathematics, Medicine, Natural Philosophy, Navigation and Neo-Platonist texts. Major authors featured include: Albertus Magnus, Alkindi, Aristotle, Roger Bacon, Cardano (whom Dee met in Southwark), Cicero, Copernicus, Dastin, Euclid, Ficino, Oronce Finé, Galen, Geber, Grosseteste, Hermes Trismegistus, Hippocrates, Jordanus, Bonus Lombardus, Ramon Lull, Pico della Mirandola, Antoine Mizauld, Sebastien Muenster, Paracelsus, Proclus, Ptolemy, Rasis, Strigelius and Tritheim. The library was unlike those of contemporaries in its size, ambition and in the relatively small number of volumes devoted to Theology or Law. It was notably up to date and reflected his desire to combine the best of ancient learning with the latest scholarship. It was frequently consulted by his closest friend, the poet and courtier Edward Dyer and by Raleigh, Leicester, the elder and younger Hakluyt, Thomas Digges, William Camden, William Bourne, Thomas Harriot, Robert Record and Dee’s pupil, Sir Philip Sidney." Roberts adds "The building of so large a library of scholarly works entailed the import of books into a country like England where learned publishing was under-developed. Many of Dee’s books were gifts but for other such as his vast Paracelsian library, he was (literally) indebted to the Birckmanns of Cologne and their agent Andreas Fremonsheim. Fremonsheim was probably responsible for the meticulously accurate catalogue of Dee’s Library made in 1583." A monograph and bibliography of Dee's library was published as John Dee's Library Catalogue, edited by Julian Roberts and Andrew G. Watson (London: The Bibliographical Society, 1990). Again, from the description: "Dee’s Library consisted of 2292 printed volumes and 199 manuscript volumes according to his library catalogue of 1583. This can be increased to c2337 printed volumees and c378 manuscript volumes if we add in materials known to have been in his library but not included in the 1583 catalogue. Unfortunately, the library was dispersed both before and after his death, with the result that a reconstruction of his library involved tracking down his books and manuscripts in both private and public ownership around the world. To date, some 344 manuscript volumes (91% of the original number) and 327 printed volumes (14% of the original number) have been traced in just over 50 libraries world-wide."